Protein crystallography images from the Advanced Light Source at the Lawrence Berkeley National Laboratory (Berkeley Lab) have helped a team of researchers make new determinations about the process by which proteins are synthesized from the genetic code. The research team made their determinations by comparing images of ribosomes taken from normal strains of the bacterium Escherichia coli to those of a mutant, antibiotic-resistant strain. Ribosomes are the organelles in living cells responsible for translating the genetic code into proteins. "This is the first time that anyone has been able to compare the structural differences between the ribosomes of normal and antibiotic-resistant strains of E. coli," says chemist Jamie Cate, who led the team. 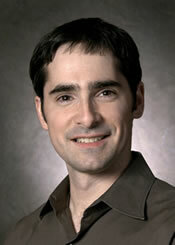 Cate holds a joint appointment with Berkeley Lab's Physical Biosciences Division and the University of California at Berkeley, where he is an assistant professor in chemistry and molecular and cell biology. "Such comparisons can help us learn more about the mechanisms behind protein synthesis." Other members of the team included UC Berkeley's Antón Vila-Sanjurjo, William K. Ridgeway, Veysel Seymaner, and Wen Zhang, plus Steve Santoso and Kexin Yu of the Whitehead Institute for Biomedical Research at the Massachusetts Institute of Technology. Their results have been published in the online version of the Proceedings of the National Academy of Science (PNAS). Ribosomes are critical cogs in the machinery of life. They bring together two different forms of RNA -- messenger RNA (mRNA), which carries genetic information from the DNA in a cell's nucleus, and transfer RNA (tRNA), which carries the amino acids in a cell's cytoplasm. The ribosome joins a chain of amino acids together to make proteins, in accordance with the genetic blueprints provided in the mRNA. Protein assembly on the ribosome depends upon an accurate decoding of mRNA's genetic information for tRNA. However, even though ribosomes have been studied for more than 40 years, the way this process actually works is only now being unraveled. A key to understanding protein synthesis is the ability to study the structure of the ribosome, which is an ancient organelle so highly conserved by evolution that its core components are pretty much the same for all forms of life. Cate and his colleagues have been looking into the ribosome of the common E. coli bacterium, long a valuable scientific subject for protein synthesis research. "Many decades have been spent developing the biochemical and genetic tools necessary to study protein synthesis in E. coli," Cate says. "We think that ribosomes from this organism will provide the best means for determining the atomic-resolution structure of the ribosome in all stages of protein synthesis." In the results reported to PNAS, Cate and his colleagues specifically compared the x-ray crystal structures of the "WT" and "hyperaccurate" forms of the 70S ribosome. The WT form is found in the wild type or natural strain of E. coli, while the hyperaccurate form is found in a mutant strain that is resistant to the antibiotic streptomycin. "Streptomycin binds to ribosomes and leads to error-prone protein synthesis, but resistant mutations in the ribosome are able to counteract the error-inducing effects of the antibiotic," Cate explains. "We're looking for structural differences between ribosomes resistant and sensitive to streptomycin that might have an effect on mRNA decoding." Although the 70S ribosome has been shown to consist of two asymmetric subunits, it is known that these subunits in isolation perform very few of the functions required for protein synthesis. Meaningful comparisons therefore require high-resolution x-ray crystallographic images of an intact ribosome. 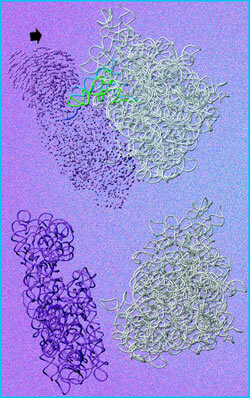 To form the intact ribosome, known as 70s, the small 30s subunit (purple) closes with the large 50s subunit (gray). However, the addition two years ago of three new "superbends" in place of conventional bend magnets now enables the ALS to also produce high quality hard x-ray beams that are ideal for protein x-ray crystallography. The superbends steer the electron beam around sharper turns than conventional bends, causing it to shed higher energy x-rays. Cate and his colleagues used ALS beamline 8.3.1, an experimental station that produces high-energy or hard x-rays -- whose wavelengths are comparable to the lengths of chemical bonds -- off a superconducting bend magnet. They focused their study on two conformational rearrangements known to take place on the 30S subunit, the smaller of the two subunits that make up the 70S ribosome. One is the closing of the 30S head around tRNA when this subunit is joined with the larger 50S subunit to create an intact ribosome. The second conformational rearrangement is an RNA helical switch near the mRNA decoding site on the 30S subunit. Although both have been proposed by other scientists as part of the way mRNA decoding takes place, the images obtained by Cate and his colleagues indicate otherwise. "While we do see the 30S head clamping down on tRNA, much like a tape head clamps down to read stored data on a magnetic tape, our images suggest the clamping is independent of mRNA decoding and probably has more to do with forming the intact ribosome," says Cate. "We saw no evidence in our images, nor in subsequent biochemical tests, that the RNA helical switch played any role in mRNA decoding." Now that they have experiments in place to image intact E. coli WT and hyperaccurate ribosomes, Cate says he and his colleagues are well positioned to find out how mRNA decoding really works. "Our goal of ultimately obtaining atomic-resolution diffraction data on intact ribosomes requires an exceptionally high-brightness x-ray source," says Cate. "The ALS is a world class facility for doing these types of experiments."